Sonnenschein is a compact loudspeaker with a full range driver. 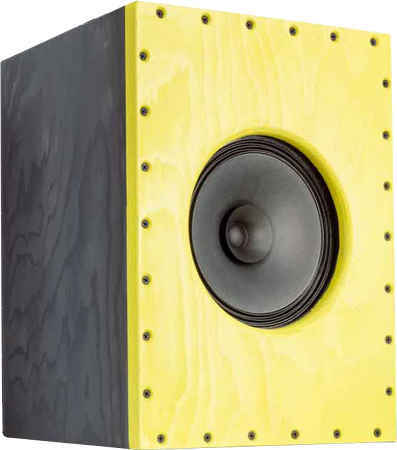 Sonnenschein is a closed-cabinet loudspeaker with drivers of Visaton . The loudspeaker has been developed by Holger Barske and Thomas Schmidt. The crossover consists of a coil and a resistor to reduce the volume in the mid and highrange. The frequency response of this speaker is nearly linear. Above 7 kHz the non-linear frequency response is typical for full range loudspeakers. At low volume, i.e. 85 dB at 1 m, the nonlinear distortions are below 1 % above 400 Hz and doesn't exceed 2 % at 95 dB at 1 m.
Important: The from K + T used amplifier electronic is not included in the kit. The high-end kit is delivered with baked varnish air core coils on important parts of the crossover for minimizing microphonic effects. - The current flow through the coil creates a magnetic field which sets the reel of wire in motion. This motion induces a voltage in the coil which adds itself to the signal. The stiffer the reel of wire is, the less the signal will be altered.